The different ways of managing the supply-demand relationship. Why is a stratification not a universal hierarchy? In describing the 3 asymmetries, Richard establishes a six-layer stratification relating underlying technologies to ultimate contexts-of-use. Thus in the case of orthotics, if we approach it from the point of view of a manufacturer of orthotic footwear, these layers look like increasingly general descriptions of the contexts within which the underlying technology will come to be used: technology=soles, product=footwear, business=footwear-to-order, solution=fitted footwear, customer demand=orthopedic patients, customer experience=difficulties in mobility. Is this therefore not just a hierarchy moving from the particular of the technology to the general of its uses? If, as a supplier, we want to take a symmetric view of demand, then this is true – ‘orthopedic patients with difficulties in mobility’ is a general definition of the footwear manufacturer’s market. But in distinguishing the third asymmetry we define the relationship to demand as being to a particular context-of-use that demands a particular form of orchestration and composition of services and products in order to satisfy it. Thus if we take up the perspective of the customer experience=the patient’s experience of living with their condition through its life, then the customer demand=that treatment for my condition that will have the greatest impact on my through-life experience at this time, and the solution=the treatment that is fitting for the current situation within its through-life context. Not surprising, then, that one of the major issues faced when insourcing clinicians employed by the manufacturers was how to reflect the through-life dimension of performance in the way the clinical service was contracted. In finding the edge, we describe the particular form of orchestration and composition needed in response to asymmetric demand in terms of a wedge of services that needs its own four-colour model of how it is aligned to demand. 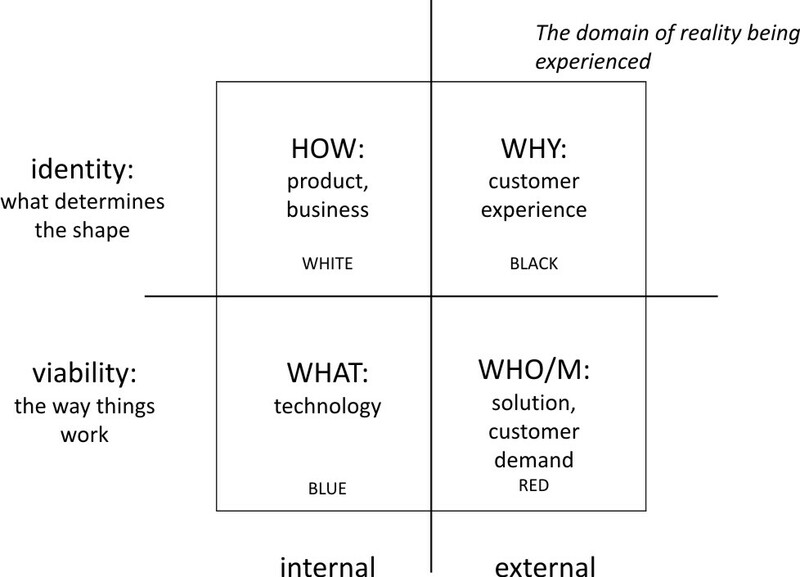 Thus for our patient, the customer experience is in the black quadrant, the customer demand and its particular solution in the red quadrant, the business and its product(s) in the white quadrant, and the technology in the blue quadrant. East-West dominance means having a business agile enough to support the particular white-red organisation needed to sustain a relationship to the distinct forms of demand arising at its edges. But now the 6-layer stratification can no longer be thought of as a hierarchy, but rather as a particular structuring of the alignment between supply and demand – something more horizontal than vertical. Internal//External: what is internal to the way we do business vs what is not. This distinguishes the provider of the insourced clinical service from the environment into which the service is being provided. Viability//Identity: the way things work vs what determines the shape of the way things work. Clinicians learn about how orthoses are made and how they can be used on the musculo-skeletal system (the way things work), but the particular ways these are shaped depend on the patients’ characteristics and the way the manufacturer chooses to do business. Addressed//Ignored: the domain of reality (later called the domain of relevance) being addressed vs not addressed. The domain defined from the point of view of the manufacturer is going to be much narrower than that defined from the point of view of the patient’s needs. The way the domain is defined is fundamental to governance-at-the-edge, and implicates the ‘I’ of the beholder. Thus when demand is assumed to be symmetric, the ‘I’ can be the view from the top/centre of the supplying business. But when it is assumed to be asymmetric, the ‘I’ must be defined collaboratively through the way the relationship at the edge is itself constructed. The 3 asymmetries and their associated economies correspond to the relationships between the blue-white, white-red and red-black quadrants, accounting for the particular way the quadrants are held in relation to each other. 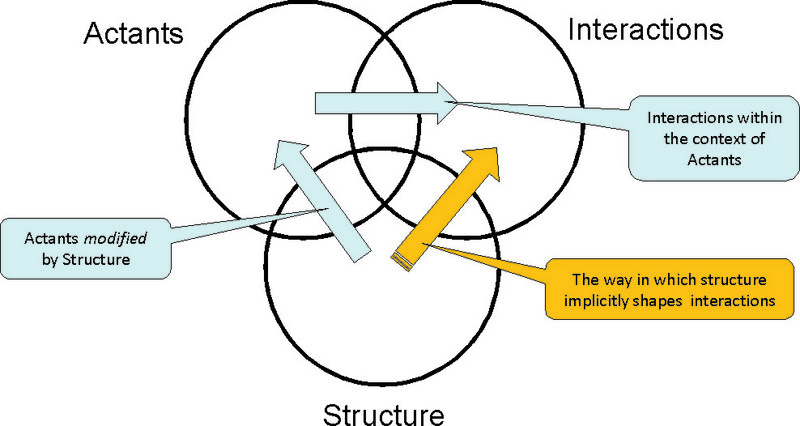 By including the third asymmetry, the stratification can no longer take the form of a universal hierarchy, but instead must be particular to the relationship to demand. It is this which presents the business with its double challenge, and the necessity to shift from an object-oriented to a subject-oriented approach to modeling the relationship of the enterprise to the demands of its clients. How are we to think about the services offered by a business taking power to the edge? One way is in terms of the three asymmetries. As pointed out here, the economies associated with the first two asymmetries can be secured under conditions of North-South dominance. This means that their profit potential is defensible because the knowledge associated with creating them is asymmetric on the side of the business: the business has something that both its competitors and client-customers do not. c-type: The value proposition is to offer a combination of products and services that can be dynamically customised in relation to the customer’s demand, based on the ability to capture economies of scope. (e.g. providing injections, or telecoms connections). The value proposition is in delivering a customised product/service where and when it is demanded. K-type: the value proposition is to offer the know-how needed dynamically to orchestrate and synchronize the use of products and services in collaboration with the client-customer in solving some part of a larger problem that the client-customer is currently experiencing. (e.g. managing an episode of care, or the way connectivities can be made available to a business in particular types of situation). P-type: the value proposition is to offer the ability to work with the client-customer on some area of pain that they are currently suffering, in order to find a way of making it tractable. (e.g. diagnosing what kind of treatment is needed, or defining what kinds of connectivities a business needs). The precise dynamics of these cycles, and the mix of rcKP value propositions offered by a business, will depend on the particular demand and competitive conditions encountered. What I have described, however, are the different kinds of service needed depending on the way in which a client-customer is choosing to internalise learning (or not) as it responds to some aspect of its own particular value deficit. It follows that if a business is to be able to sustain power at its edge, then the services it offers will involve some mix of K-type and P-type services. The interesting thing about this mix is that its dynamic and collaborative nature makes the services necessarily relational, creating (at least) two-sided markets in the relationships a business has with its client-customers. More is written about the rcKP cycle in Understanding Value Propositions and Effects Ladders. In his Confused of Calcutta blog, JP Rangaswami (now CIO of BT’s Services Division) picks up a definition of Enterprise Architecture from Andrew McAfee: “IT that specifies business processes”. There may well be situations where it makes sense for the business process to be specified (=overdetermined) by IT. But there are other situations where this doesn’t make sense at all, because of the asymmetrical relationship between business and IT. Are there intelligent ways of implementing enterprise IT without constraining (=overdetermining) the business, thus respecting the need for agility? We believe there are. But it’s probably not going to happen if it is left up to those “respectable” consultants who are the target of JP’s criticism. Scale: The ability to create additional output from an existing capability, reducing average unit cost. (i.e. producing more output from the same technology infrastructure). Scope: The ability of a business to extend the scope of its operations across different markets reducing average operating costs. (i.e. covering more markets with the same business process infrastructure). Alignment: The ability to create additional ways of organising the business relationship with a customer over time, reducing the average cost of alignment of business operations to the dynamics of each customer relationship. (i.e. managing more distinct customer relationships over time supported by the same infrastructure). Why take power to the edge? Because it generates economies of alignment in the management of a relationship over its life. Demand Asymmetry means that the forms of demand are increasingly specific to the context in which they arise. The first asymmetry involves separating out technology from the supply of specific products. This requires modelling of possible behaviors that can be supported (so Microsoft or car manufacturing has to modularize itself in support of families of technology use). The second asymmetry requires separating out business models that can organize supply from the solutions that are on offer. This requires modelling of the possible forms of business geometry (so rail maintenance or retail services have to use a franchise model to allow the variation in business organization to accommodate the variety of ways in which the service needs to be implemented). It is worth considering what happens if these asymmetries are ignored. In the first asymmetry, this means defining the product by the technology. This is typical of the early stages in the emergence of new technologies. (Do you remember how we used to have to use mobile phones?). 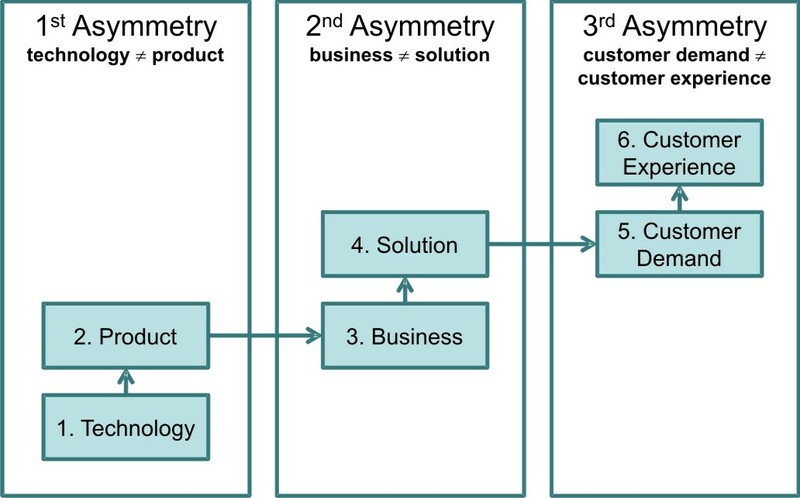 In the second asymmetry, this means defining the solution for the customer by the way the business is organized. (Do you remember how large businesses used to relate to their customers before CRM?). And in the third asymmetry, the solution to the problem presented by the customer is assumed to be what the customer actually needs. (Have you ever received a prescription from the doctor that turns out only to treat the symptom?). Charlie, Referring to your last blog on responding to diversity in value models, you are of course right that it is not possible to consider the supply-side without at least implying a particular relationship to the demand-side. What is interesting is the supply-side logic that governs the way in which the supply-side looks at the demand-side. Thus a car manufacturer ‘projects’ onto the demand-side all kinds of assumptions about what it is interested in. In asking whether it is useful “to look at the demand-side variation independently of the supply-side”, I was asking under what circumstances the demand-side logics governing use could be considered independently of supply-side logics… arguably any market where there is a significant degree of standardisation and commodification is one where this separation of logics is taking place. Thus managing mobility separates from the choice of automobile or airline, and managing connectivity separates from the choice of particular digital platform (qua iPod, mobile, handheld etc). It was for this reason that Richard and I tried to separate out the three asymmetries in the Governance paper. Clearly the dilemmas and trade-offs you raise dominate when dealing with the first asymmetry (the technology is not the product) – as you graphically illustrate with the example of the SUV. This is also true when dealing with the second asymmetry (the business model is not the customer’s solution), but to a lesser extent. 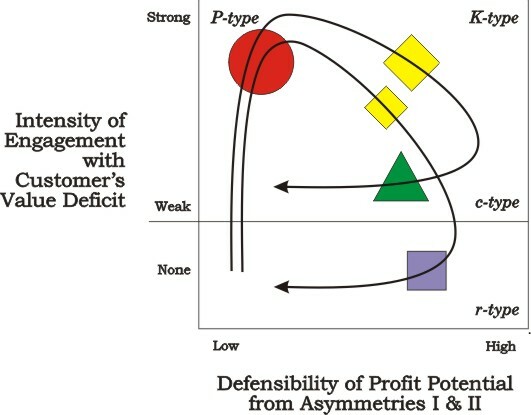 Thus with the second asymmetry, the low fares/low cost business model established an alternative solution to that offered by United, American etc, confronting those airlines with the necessity of using a varying business process model depending on the characteristics of the market segment being addressed. It is managing this second asymmetry that has dominated much of the flattening/restructuring/ outsourcing of businesses in the last 25 years or so (and perhaps the remarkable increases in the productivity of US businesses). And you are right to point out that the equilibrium established in relation to any given asymmetry reflects the economies of scale and scope that limit how much diversity can be spanned – modified of course by the constraints placed on competition. It is managing this constraint that your paper addresses so well, and which ultimately necessitates the dominance of supply-side logic. But it is with the third asymmetry (the customer’s demand is not the customer’s experience) that something new happens. Thus the customer’s demand may be necessarily dynamic (the way they use ICT in support of their business), or necessarily emergent (the way the patient’s chronic condition develops over time), or just idiosyncratic (each client wants their investments managed in a way uniquely suited to their family situation). In each case, there is a need to orchestrate available commoditised services and products and add a new level of interoperation through the way they are composed with the experience/life/situation of the client-customer in a way that is particular to both the time and the relationship – adding a new level of business model that itself becomes real-time (real-time business). This presents a new challenge, particularly in the way the role of software architecture needs to be understood, because from the point of view of any one service or product, these new uses are emergent. It won’t surprise you to know that our work involves supporting the needs of real-time business – defining the strategies, identifying and mitigating the risks, creating the governance. But it is a difficult terrain to distinguish. How are we doing!